In France, churches traditionally belong to the parishes in which they are located, but were placed at the disposal of the clergy by the 1905 law separating Church and State. This dual administration still causes problems for their maintenance and conservation. “A church is designed for worship, it should not be allowed to become a museum”; says Father Bernard Violle, a member of the diocesan commission for religious art in Paris. “The Church tends to assume that liturgical practice should have priority in a monument, we think the opposite”, says Maryvonne de Saint-Pulgent, head of the department dealing with the national heritage at the Ministry of Culture. The law separating Church and State, passed on 9 December 1905, established State ownership of cathedrals and parish council ownership of churches built before 1905. The inevitable result has been serious differences of opinion between clergy and government over the administration of religious buildings. On the other hand the priest in charge, who holds the keys, may decide the use to which the church is put and the hours when it is open and closed. In the past, the clergy sometimes “forgot” to obtain the mayor’s permission to make alterations to a church. In the 1960s, after Vatican II, the church desired to divest itself of some of the liturgical items in its possession, judging them too ostentatious and unsuited to the new liturgy, which was much more austere. Objects such as choir screens, communion rails and thrones were no longer needed. In 1964 the parish priest of Saint-Roch in Paris illegally sold the church’s chandeliers to an antique dealer. The affair was hushed up by the administration at the time and the chandeliers are now hanging in an apartment in New York. In another example, a parish priest in Brittany handed over a collection of listed neo-Gothic furnishings to a scrap dealer; the error was discovered by the chief inspector of historic monuments before it was too late. In the clergy’s defence, parish councils generally neglected their religious heritage and were not particularly eager to enforce their rights of ownership. “For many years the art of the 19th century, to which most of the furnishings of Parisian churches belong, was held in mild derision by conservationists. A 19-century communion table was removed with the permission of the conservationist in charge, who regarded it as old-fashioned and worthless”, says Father Violle. When in 1970 the Revenue asked the Parisian authorities for an inventory of their possessions in Parisian churches, the municipality had to admit its ignorance on the subject. Since that date a commission has been created to list the chattels and furnishings held by churches in Paris; the inventory is still being drawn up. For their part, art historians are still mistrustful of clerical taste, accusing the clergy of a lack of culture and blaming them for putting their own interests first. Since the 1960s discussions between the government and the church have focused largely on altars. Since the Second Vatican Council the priest celebrating the mass no longer has his back to the congregation. The clergy thinks this means that altars need to be moved. Because the altar is an integral part of the building, conservationists consider that altars should not be moved. The 1905 decree permits the priest to move furniture inside the building, or to place things in outhouses when they are no longer in use, but to move fixed items such as an altar he needs the permission of the commune. Maryvonne de Saint-Pulgent reveals that permission was requested by the clergy to shift the high altar in Rheims Cathedral, but the request was turned down. 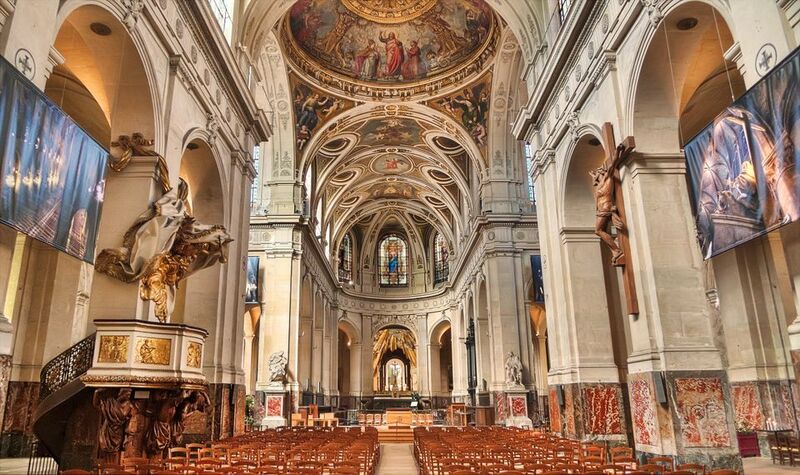 Recently the parishioners of Saint-Christophe-de-Javel, in the 15th arrondissement, asked permission to cut down the choir screen. They wanted to push back the altar in order to add two extra rows of pews to accommodate a larger congregation in the nave. “We refused permission because the integrity of the building was threatened”, explains Yves Gagneux, supervisor of church furnishings in the cultural affairs department of the Ville de Paris. These constraints annoy the clergy, who would like to be allowed to organise churches according to liturgical requirements. “The administration tends to encroach on the freedom of church furnishings to be moved around. In the case of a statue that is awkwardly placed, for instance, the parish priest should be able to move it without too many difficulties being put in his way”, says Isabelle Renaud-Chamska, secretary-general of the national commission on religious art, set up by the conference of French bishops. In order to tackle such problems, and to keep an eye on church furnishings nationally, the Catholic church has set up a commission on church art in every diocese. In addition, to alleviate tension between Church and State, a commission for the protection and enrichment of the country’s cultural heritage was created in 1979 to deal with all aspects of religious art. The clergy suspects that the government would like to remove all devotional objects from churches and put them in museums; they would be safer than they are in religious buildings, where they fall easy prey to art thieves. In Paris a number of items from churches have been placed in the Musée du Petit Palais; gold plate from Sainte Clothilde is in the Musée d’Orsay, but these transfers are not permanent. In the opinion of Isabelle Renaud-Chamska, “these church furnishings are primarily devotional objects, not works of art, and must stay in the churches”. Broadly speaking, Maryvonne de Saint-Pulgent agrees: “We are opposed to removing things to museums; as far as possible items should remain in churches”. With a view to preserving the most valuable objects where they are, some churches have gathered them together in a “treasury”, but this demands a security system. Maryvonne de Saint-Pulgent reports that the chapel at Gimel, in the Corrèze, has received financial assistance towards the security measures needed to create a treasury. Secure display cabinets installed in redundant side chapels have been suggested as one solution. A number of parishes have deposited their collections of devotional art in museums, safe from damp and thieves. The parish priest may claim back items at any time if he requires them for a church service. The museum of religious art in Pont-Saint-Esprit (Gard), which opened last year, is based on this type of arrangement. The civil and religious authorities sometimes reach a compromise over arrangements inside a church. At Saint Etienne-du-Mont, in the fifth arrondissement in Paris, an altar has been installed on a wooden dais so that the priest can face the congregation during Mass, a solution that was adopted 20 years ago as a temporary measure. As part of the restoration plan of about 20 churches in Paris the city authorities are to issue descriptive booklets on each church. However, some priests refuse to allow labels to be placed on the walls next to works of art because the result is too reminiscent of a museum. Brochures have already been published for the churches of Saint-Roch and Saint-Thomas-d’Aquinas; each contains a short history of the church plus a plan and notes on the objects of interest contained in the church. “We want to encourage tourists to visit churches in Paris as they do in Rome”, Yves Gagneux says.